A call to Dale Barnett remedied the situation. When he delivered two face cords last fall, I called him the most reliable guy in the UP. Nothing has changed. A call in the morning. Dale and his wife unload the truck in the afternoon. We are ready for another year. He said these cords were not as "gray" as he liked, but would dry up nicely over the summer. He included a 1/4 cord of dry wood from his garage for immediate use. 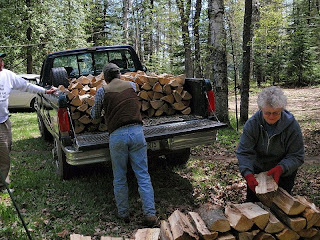 This year, like last year, we enjoyed a beer on the deck with the Barnetts after unloading the wood. 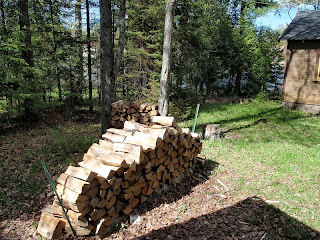 Dale had a banner year delivering wood over the long cold winter. We talked about fires and firewood and hunting and UP predators like cougars and coyote and wolf. 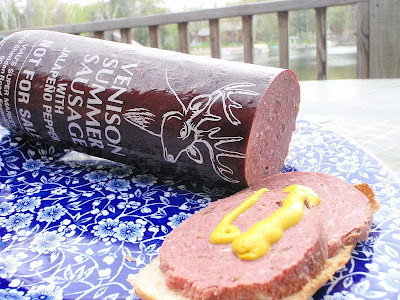 Anyway, we are apparently now one of their favorite customers, as Mrs. Barnett gifted us with the venison summer sausage pictured at the top of the post. From a deer that Dale shot - it was smoked and made into sausage by an operation in Escanaba. It is really really good. No, none of it will make it back to Chicago. It is likely none of it will make it past the weekend. On first glance I thought you'd resorted to burning sausages in the stove. At least no kangaroos were involved. the Venison sausage looks awefully good. Please order a case and lay it down in the wine cellar for aging. If you look closely at the label, you will see it says "Not For Sale". 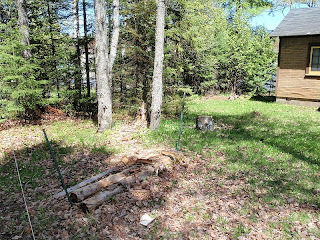 If we want a supply of venison sausage, we'll need to shoot a venis and take it in to Escanaba, have it smoked and sausaged. I like the look of this wood, much better than the last batch. no mold or rot. the "not for sale" label does not apply WITHIN the UP ! LOL ! It is there to prevent interstate commerce ! In the UP - those silly labels don't mean anything.